Daniel Bernard Roumain (known by his initials, DBR) is a classically trained composer, performer, violinist, and band-leader noted for blending funk, rock, hip-hop and classical music into an energetic and experiential sonic form. DBR is of Haitian-American heritage and he attended Dillard Center for the Arts in Fort Lauderdale, Florida. He received his undergraduate degree from Vanderbilt University's Blair School of Music and earned a doctorate in musical composition from the University of Michigan. He combines his classical music roots with a multicolored spectrum of contemporary black popular music. DBR's exploration of musical rhythms and pulsing sounds is frequently peppered by cultural references. His dramatic pieces range from orchestral scores and energetic chamber works to rock songs and electronica. He recently contributed a chapter to Sound Unbound: Sampling Digital Music and Culture (The MIT Press, 2008) edited by Paul D. Miller a.k.a. DJ Spooky. DBR is the father of Zachary Daniel Roumain. As a composer, DBR has collaborated with an array of orchestras and chamber ensembles; the orchestras of Dallas, Des Moines, Memphis, San Antonio, St. Louis, and most recently the Chicago Sinfonietta, the Brooklyn Philharmonic, the North Dutch Orchestra, and the Stuttgart Chamber Orchestra have performed or commissioned his works, and Bill T. Jones and the Orchestra of St. Luke’s regularly collaborate with him---DBR is the Music Director of the Bill T. Jones/Arnie Zane Dance Company and the Assistant Composer-in-Residence of the OSL. As Artist-in-Residence at Arizona State University, DBR collaborated with Philip Glass in Seen & Heard: Philip Glass and DBR Together on Stage, Screen and in Sound. He also serves as the Artist-in-Residence of the Seattle Theater Group sponsored by Starbucks. Current projects include his 2007 debut season at BAM’s Next Wave Festival featuring One Loss Plus (his fifth evening-length solo show) for violin, video, and chamber ensemble; 24 Bits: Hip Hop Studies and Etudes and Event Pieces performed by DBR on piano and laptop; and Call Them All: Fantasy Projections for Film, Laptop, and Orchestra, his latest orchestral work which received its world premiere at Carnegie's Zankel Hall by the American Composers Orchestra. In etudes4violin&electronix, DBR’s debut solo album from Thirsty Ear Records, he works with notable musicians including Philip Glass, Ryuichi Sakamoto, DJ Spooky That Subliminal Kid and Christian A. Davis (aka DJ Scientific). This hybrid album offers a series of lyrical and pulsing duets and solo works geared towards the iPod generation. In 2008 an excerpt from One Loss Plus was included on the compilation album Crosstalk: American Speech Music (Bridge Records) produced by Mendi + Keith Obadike. 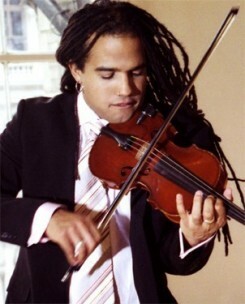 As a violinist and performer, DBR performed his arrangements of Cassandra Wilson’s Glamoured with the jazz vocalist and her quintet while conducting the Seattle Symphony Orchestra and Buffalo Philharmonic; rocked with DJ Spooky at the Lincoln Center Summer Festival and premiered a ground-breaking fusion of incompatible cultures and instruments with DJ Scientific in DBR’s Sonata for Violin and Turntables at the Melbourne Arts Festival and Vancouver’s PuSh International Performing Arts Festival for the Performing Arts. DBR performed at the Other Minds festival in San Francisco with the Del Sol String Quartet and DJ Scientific, A Civil Rights Reader for Strings, Laptop & DJ. As a band leader, he presents lively, genre-jumping shows with DBR & THE MISSION; nine young, multi-cultural musicians including an amplified string quartet, drum kit, keyboard, DJ, and laptops. Described as “an evening of chamber music with the accessible feel of a rock concert,” the band’s multi-disciplinary performances have been applauded at Washington D.C.'s Kennedy Center, Miami’s Caleb Auditorium, NYC’s Cutting Room, Chicago’s Northwestern University, Arizona State University's Gammage Auditorium, Montclair’s Kasser Theater, Reno’s ArtTown Festival, and as part of Boston’s Bank of America Celebrity Series. DBR’s 24 Bits: Hip Hop Studies and Etudes were highlighted at the group's sold out Joe’s Pub performance---“true to form, these vary greatly in style, from slow, introspective Neo-Classical ruminations to rhythmically complicated, riffy pieces that would not be out of place in a dance club,” (New York Times). In honor of Black History Month, the band’s SQ Unit culminated a nationwide tour of DBR’s string quartet program, A Civil Rights Reader, at Washington DC’s Library of Congress.